The reception is one of the most fun parts of the entire weekend. Couples look forward to this event the most. They get to finally let loose and party with friends and family. You have to set the right tone for the night. If you are excited and energized then people will feed off that energy and do the same. But before the party begins, there are a few more intimate moments to go through; one being the mother son dance. 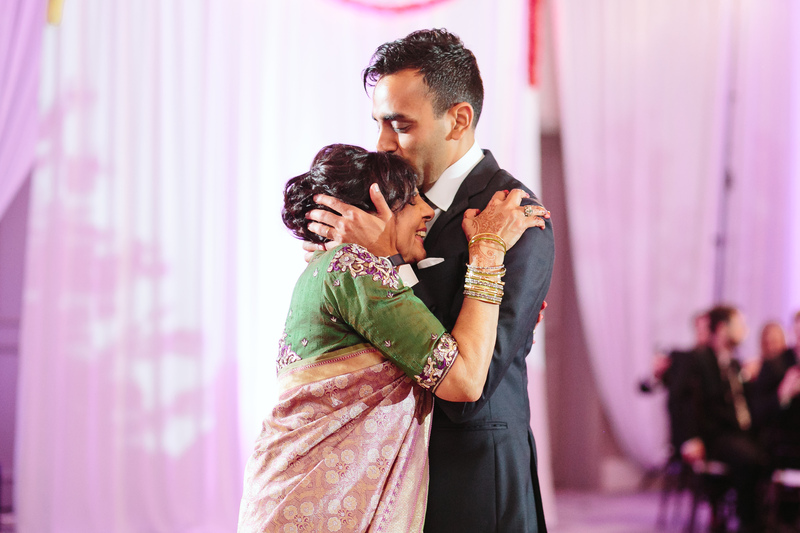 Most of the time the groom will choose an Indian song for his dance with his mother, but we wanted to give you a mix of Indian and American songs that are great for a mother son dance. We have seen many weddings where the groom and his mother either use these songs or consider using these songs. We kept a loving mother son dance in mind, when choosing these songs to be a part of this blog. The following Top 6 Indian Wedding Reception Mother Son Dance Songs are ranked based on what we have seen used most often within the last few years. The Top 6 Indian Wedding Reception Mother Son Dance Songs list begins with Janam Janam from Phata Phoster Nikhla Hero. From lifetime to lifetime your mother will always have a special place in your heart. Don't be surprised to see this song at the top of the list, for a long-long time. Atif Aslam did a wonderful job expressing a love between a mother and her son. Fill out the form on this page and we will send you an email with all these songs on a playlist. If you need a song for your groomsmen reception entrance, check out this blog. Here's a song all the 90's kids will enjoy dancing to with their mother. If this doesn't bring tears to your eyes, we don't know what will. When a groom is able to show his emotion in front of everyone at the reception during the mother son moment is truly touching. Fill out the form on this page and we will send you an email with all these songs on a playlist. If you need a song for your bridal party's reception entrance, you should check out this blog. The third spot on the Top 6 Indian Wedding Reception Mother Son Dance songs list goes to Phil Collins' You'll Be In My Heart. A mother's love is something to cherish. From birth to your oldest day they always worry about you and want what is best for you. Make sure and make the most of the mother son moment at your reception. If you need a DJ for your wedding that knows music and will take care of, contact us here. Here is the oldest song on this blog series but nonetheless it still has a great feel meant to be used for the mother son dance. Ask your mother if she knows this song, she'll enjoy hearing this throwback. Fill out the form on this page and we will send you an email with all these songs on a playlist. If you need song for a grooms ceremony entrance, check out our blog. The fifth spot on the Top 6 Indian Wedding Reception Mother Son Dance Songs list goes to the Backstreet Boys. Who was your number one fan growing up? Who watched all your games? Who made sure you were fed? Who made sure you did well in school? God's greatest gift is a mother. A mother is so nurturing and loves you unconditionally. Dedicate the mother son dance to your mom with this song! Fill out the form on this page and we will send you an email with all these songs on a playlist. If you need a song for your single brother's reception entrance, check out this blog. The final song on the Top 6 Indian Wedding Reception Mother Son Dance Songs list goes to a classic Bollywood song from the 90's. If you are a fan of Bollywood and so is your mother, then this song could be the one for you to use for the mother son dance. If you still need a song for your parent's reception entrance, check out this blog. A wedding is the happiest moment in your life and you should choose music that you love. Over our 25 years of bringing joy to thousands of couples, the DJ Riz Entertainment team has helped many couples find the songs that help them create memories for a lifetime. Top 6 Indian Wedding Reception Mother Son Dance Songs list was made to help busy couples that don't have time to find the best music for their big wedding weekend. If you or a friend needs an Indian wedding DJ that will take the time to understand what you need and help make your wedding weekend perfect, contact us here for more information on our services.